Kenwood KH-KR900 review | What Hi-Fi? If you’ve ever spent money on car audio, it’s likely you’ll have come across Kenwood. The Japanese brand is well known for kitting out cars with everything from amplifiers and speakers to navigation systems. Go to Kenwood’s website and it has a random assortment of goodies under a home entertainment banner too: hi-fi systems, receivers, a trio of in-ears and, for those who don’t get on with buds, the KH-KR900 on-ears. You may be more likely to stumble upon them on JVC’s e-shop – the two company’s merged back in 2008 to form what is now JVCKenwood. It’s a good job they’re under a separate ‘Kenwood Headphones’ banner, because we doubt they’d catch your eye in among the copious amount of colourful JVC models. In fact, we’d go as far to say the KH-KR900’s carbon grey/black exterior looks a bit plain – perhaps what you’d imagine a headphone to look like before it enters the beautification stage. Less can be more, of course, although in a competitive market where appearance counts for quite a lot, we do feel they need to make more of a statement. 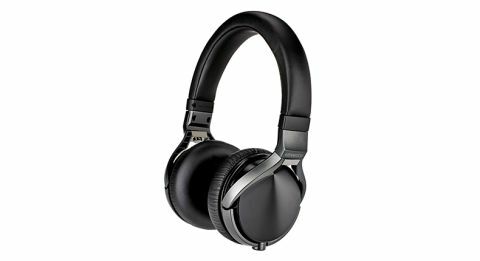 Our Award-winning Philips M1MKII (£135) look twice the price with their premium-feel fusion of metal, leather and memory-foam. The plastic-tastic body feels quite cheap too, but does have an advantage. The last thing you need are headphones weighing you down on the morning commute, and thankfully the Kenwoods are sympathetic to your cause. Although they aren’t the smallest on-ears we’ve seen – the cups are about the size of an apple – they’re nicely lightweight, clasping to your head with just the right amount of pressure. The firm pleather ear pads could do with a bit more cushioning, although we’d imagine they would soften up over time, while the cups swivel to fold flat and fit more easily into a bag. You can also shove them in a bag, safe in the knowledge that the flat-sided (1.2m) cable wont get itself in too much of a tangle. The in-line one-button remote and mic that sits nicely shoulder-length is Apple- and Android-friendly too. Whether we plug them into a DAC or straight into a smartphone, the KH-KR900s throw out a fairly weighty sound that’s easy to listen to and almost gets you your money’s worth in clarity and detail. Play Rae Morris’s For You and they pick out the subtle bells that pepper the soundstage. The accompanying piano has body and solidity, and there’s clear differentiation between keys that are struck hard and lightly pushed. They stay composed in the explosive chorus, and communicate changes in pace well too. The song lives and breathes off Morris’s emotionally-drenched vocals, which are clear and focused through the Kenwoods, even if we do get more of a taste of them than the full flavour. However, the more transparent Philips M1MKIIs treat the song with wider eyes, conveying the subtle dynamic lifts in her vocals that the Kenwoods tend to ignore. The Philips are better-timed too, offering more in the way of rhythmic drive and punch. End with the Ying Yang Twins’ Dangerous and, while the KH-KR900’s slightly overstated lows will please bass junkies, they aren’t as tight or punchy, sounding a little sloppy in comparison. By now, you’ll realise that your money can be better spent elsewhere, and that’s the Kenwood’s problem. Their clear, easy-listenable sound is just fine, but a ‘just fine’ performance didn’t get Katherine Hepburn four Oscars, and it’s not getting the Kenwood KH-KR900s an Award nod either. And certainly not when the competition at this price point is so tough.